The City of Cleveland has awarded the Design/Build contract for the new Crooked River Skate Park to Grindline Skateparks of Seattle WA. The new skatepark will serve local residents and to help spearhead further development of the Columbus Road Peninsula. This section of the Flats is already home to the Ohio City Bicycle Co-Op and the home of the Cleveland Rowing Foundation & Rivergate Park. Columbus Road Peninsula will become a people-powered recreation district nestled along the Cuyahoga River. As of July 2012, the Cleveland Metro Parks is the new owner of several acres along the Cuyahoga off Columbus Rd and has opened the Rivergate Cafe right next to the skatepark site. The new Rivergate Park will see many changes as the Metroparks seeks to bring many new programs to the east bank of the river and build off the momentum started by the Cleveland Rowing Foundation and Crooked River Skate Park project. April 14th, 2011: The Tony Hawk Foundation has awarded PSG the maximum level of funding through their skatepark grant program. PSG will receive $25,000 to help fund the Cleveland Skateboard Park. Please help us complete our funding by making a donation directly to our Cleveland Skateboard Park fund. Your donation is 100% tax deductible. Click the DONATE in the right column. Please contact us if you want to sponsor a portion of the skateboard park! "The unparalleled advocacy of northeastern Ohio's Public Square Group should serve as a model for skatepark supporters throughout the country." As part of the Mayor Jackson and CIty Council vision of a new, re-imagined Flats district, the skatepark will provide instant foot traffic with hundreds of people per day for 9-10 months of the year for only simple maintenance compared to other recreational facilities. Self-managed, self-policing and self supervised skateboard parks provide sustainable recreation opportunity for generations to come with minuscule ongoing tax payer burden. Joins Cleveland Rowing Foundation, Cleveland Metroparks, Ohio City Bicycle Coop and Brite Winter Festival as the beachhead in the new community and recreation centric Flats. Grindline completes the conceptual design phase. 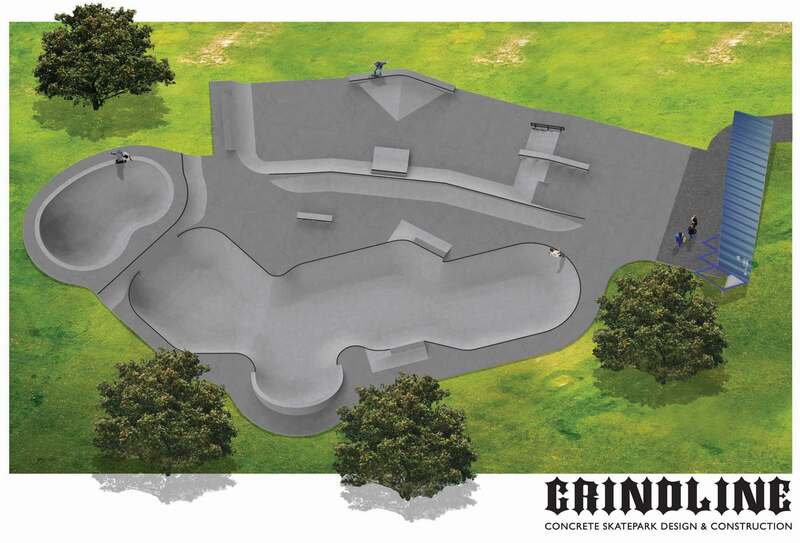 World-class skatepark design/build firm Grindline has finalized the conceptual design of the skatepark. Based in Seattle, Grindline is one of a small handful of world renown design/build firms that have ushered in a new era of skatepark design and construction. They engaged with Parkworks LAND Studio to design the new skateboard park for Cleveland and will be one of the main candidates for construction. Three different conceptual designs were created based on all the ideas and comments from the first public meeting on April 28th 2010. These concepts were refined based on feedback and ideas from the public starting at the June 22nd public meeting and comments and ideas collected since then. The final design chosen was the "Snake Run" concept featuring an iconic snake run and deep kidney bowl along with various street/flow elements and double ledge lines around the edge. Materials feature a mix of concrete, brick, granite, and pool coping. 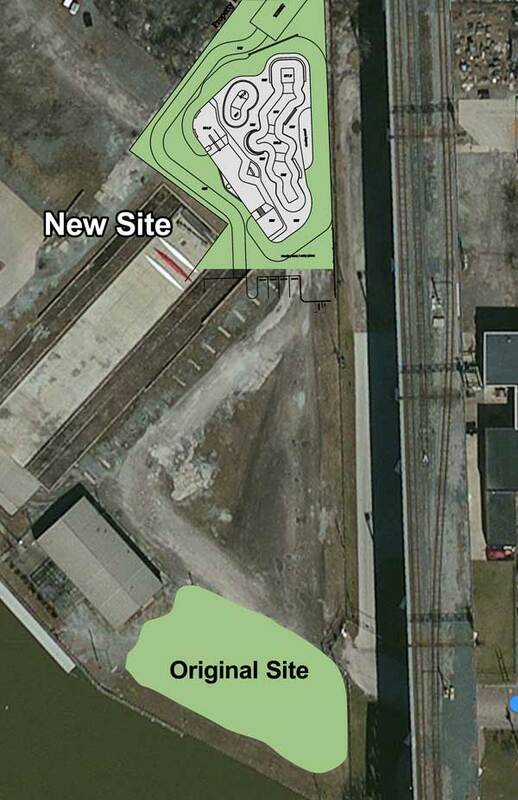 Feb 15 2011: Plain Dealer Editorial: A new skatepark by the Cuyahoga? Cool! 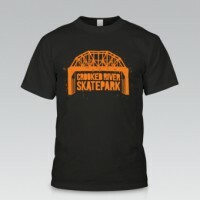 The Crooked River Skate Park is located west of Hart Crane Memorial Park off Columbus Road on Merwin Road. Grindline and F.Buddie will begin construction in June 2014. Join PSG to get updates on this and all our projects.